I’ve been using Facebook and it’s growing family of products for years. I first tried using Snapchat in 2012, back when it was an early but growing disappearing photo app. It never quite stuck for me. I still don’t use Snapchat much and would barely count as a monthly active user. I do understand why people love it. It greatly reduced the friction of sharing photos and short videos with friends. Plus it’s made sharing more fun through the use of filters and augmented reality (AR). 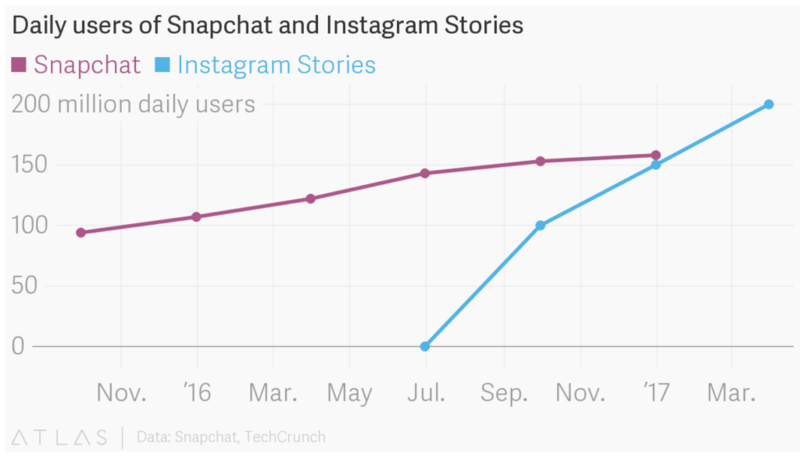 Snapchat launched Snapchat Stories in October, 2013. Instagram launched Instagram Stories in August 2016. WhatsApp launched an update to WhatsApp Status in February 2017 that incorporated features which resembled Snapchat Stories. Messenger Day launched in March 2017 as a Stories-style feature for Messenger after being in testing since Q3 2016. Within a few weeks of Messenger Day’s launch, Facebook announced the launch of Stories in the core Facebook app. Over the last year, Facebook’s been maniacal about incorporating Stories into each and every one of it’s products. This isn’t by accident or something they woke up one day and decided to do. It’s part of a deliberate product strategy that started 5 years ago. Now, five years later they are being called out for copying. There’s actually a really important reason that they had to do it. Facebook has been experimenting with camera-focused apps since since 2012. Poke, Slingshot, Camera and Moments have all been standalone app experiments launched by Facebook. Today, Moments is the only one that’s still available for download. These apps have not only been focused on camera and sharing functionality. They’ve also been targeting core audiences that Facebook wants to keep. In the case of Poke and Slingshot, the target has been the younger generation of consumers. Snapchat’s core audience. Facebook hasn’t been successful with their standalone apps. Success came once they started incorporating the Stories feature into their existing products. 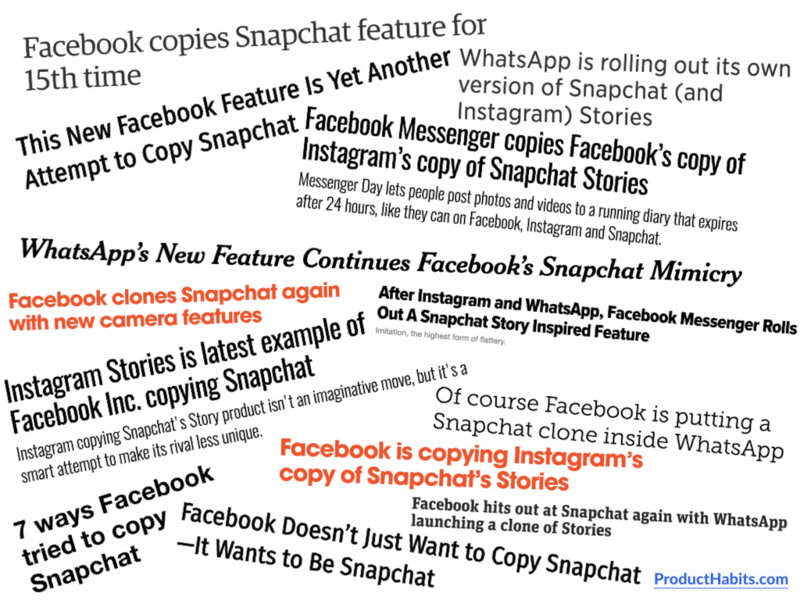 As the Snapchat Stories cloning continued, press headlines started getting increasingly critical of the strategy. The critics questioned Facebook’s ability to innovate. Claimed that the Stories cloning strategy has created a mess. Called them out for blatantly ripping Snapchat. Even suggested that all social apps are starting to look the same. Facebook originally started with college students. In the early days, you couldn’t sign up for the product without a college email address. Despite expanding their user base, if Facebook can’t keep the attention of college students, they’ll be in trouble. Students are the younger generation, the ones who Facebook needs to start with and continue to be relevant for as they grow up, get jobs and have their own families. If Facebook can’t actively recruit new generations, it’s a matter of time before Facebook dies. It might take a decade to kill them but they’ll begin spiraling down an irreversible decline. Just like print catalogs. For Facebook to survive, they must dominate every new group of students that enters college. 58% of these college students said that they’d check Snapchat first over Facebook, Instagram and LinkedIn combined. Facebook came in at 13%. LinkedIn lagged behind with only 2%. Snapchat now has the most attention from college students. 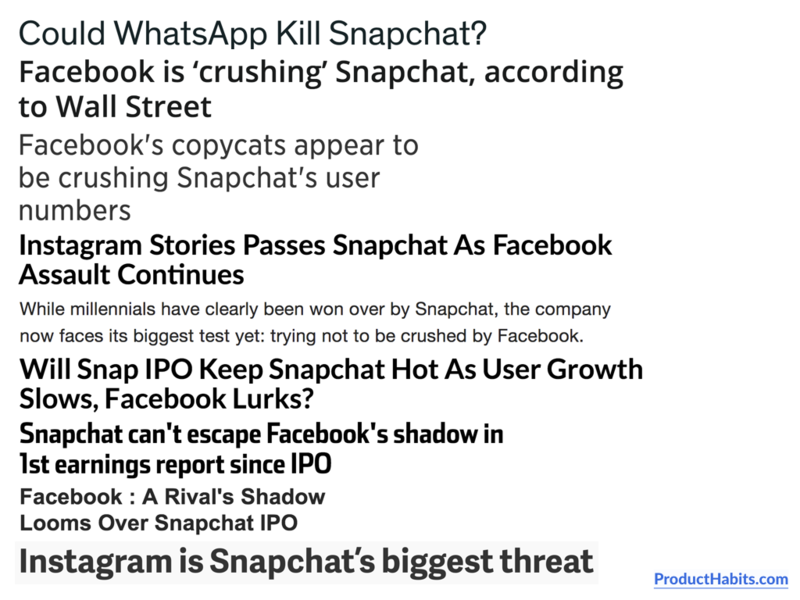 This is exactly why Snapchat puts Facebook’s dominance at risk. The last time this kind of threat showed up for Facebook, it was because of a product called Instagram. A small team of a dozen or so people had figured out the best mobile user experience for social photo sharing. Instagram had gained early traction with the younger generation. That’s exactly why Facebook couldn’t afford to lose to Instagram. So, Facebook swiftly scooped up Instagram with a successful $1 billion offer in April 2012. A price that most people thought was too high. But Facebook knew it was worth it for the company as a whole. The acquisition was a long-term bet. Instagram had 860,000 daily active users at the time of the acquisition and just six months later that number grew to 11 million. Facebook’s huge bet had quickly started to pay off and it’s still paying off. Facebook was right. The company is prepared to do whatever it takes in order to fend off any competitors that get serious traction. Snapchat Stories was first launched in October 2013. Prior to this, Snapchat was just a private messaging app that let users send disappearing messages to each other. Stories changed the game by creating a feed-like experience inside of Snapchat more similar to Facebook’s Newsfeed and Instagram’s Homefeed. Just a month after Snapchat Stories launched, The Wall Street Journal reported that “Snapchat Spurned $3 Billion Acquisition Offer from Facebook”. This was a sign that Facebook won’t stop. It’s in their DNA, they’ll do whatever it takes to win. 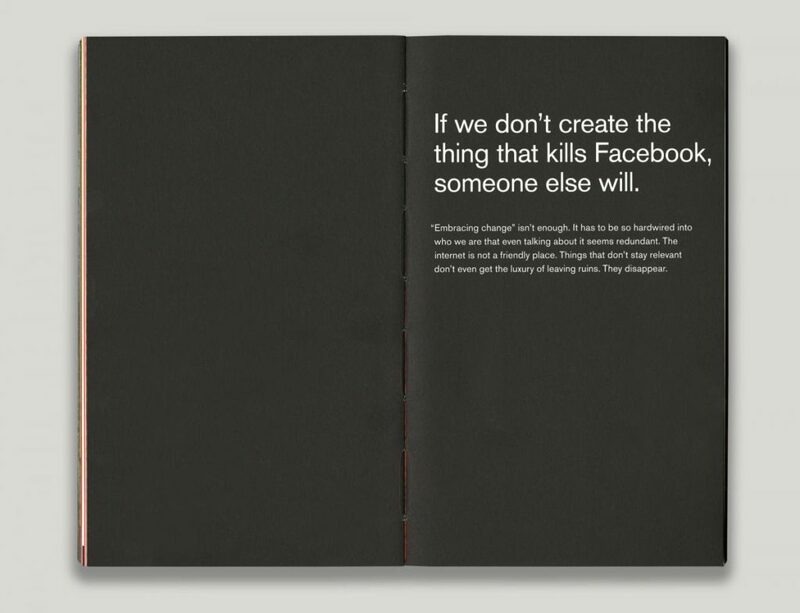 A gift given out to Facebook employees for the company’s 10th anniversary helps explain why they have this philosophy. The gift was called the Little Red Book. There’s two publicly shared pages which shed light on Facebook’s core approach to competition and product strategy. This one statement sums up how far Facebook as a company is willing to go in order to ensure that their products stay relevant for the long term. From multi-billion dollar acquisitions to implementing the same feature across all of their products, nothing is off the table when it comes to ensuring that Facebook stays relevant. How do they do it? 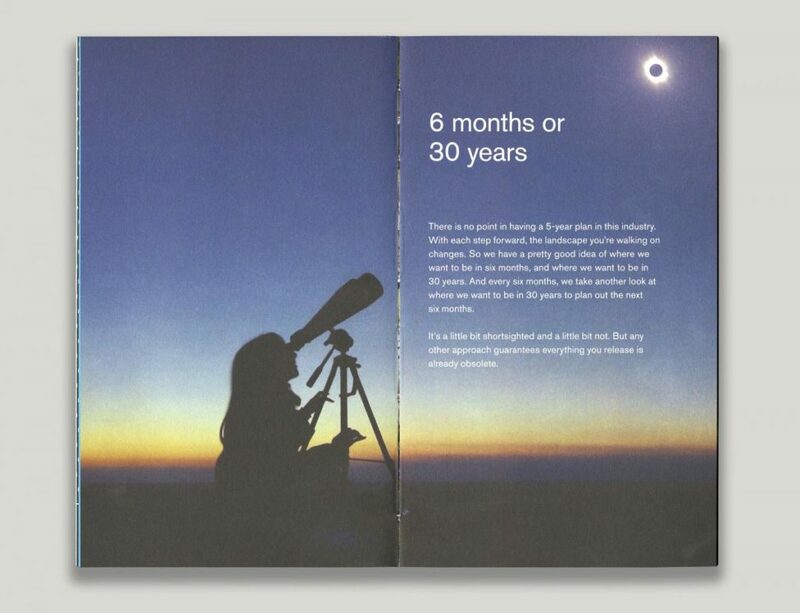 Another page from the Little Red Book describes their business strategy. Facebook has been constantly reevaluating their strategy and execution every 6 months based on where they want to be in 30 years. It’s how they’ve stayed focused on the long-term while planning and executing in the short run. Why would Facebook prioritize their product strategy across their family of product to focus on copying one single feature from Snapchat? They don’t want to become irrelevant. They’ll do whatever it takes. Whatever it takes to win consumers over. Facebook’s product prioritization strategy has worked. They’ve taken the thunder out of Snapchat’s IPO. 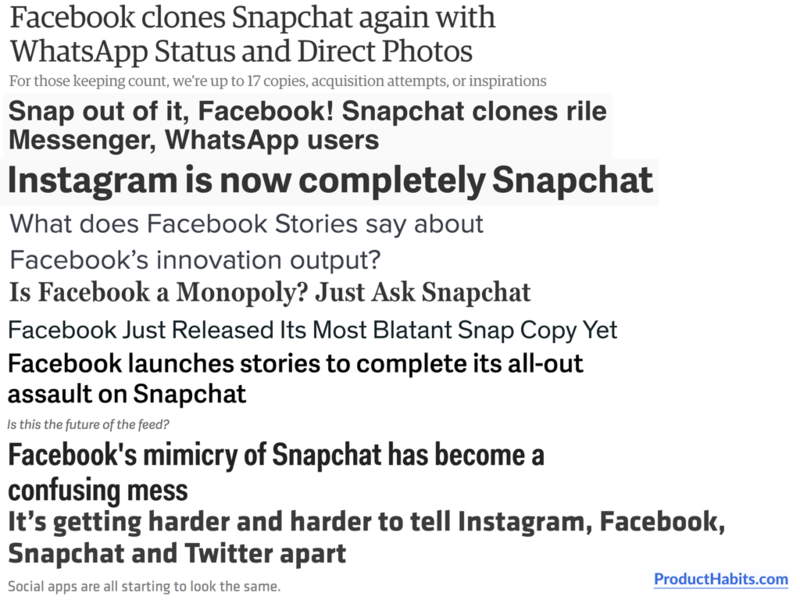 Aggressively cloning Snapchat Stories has resulted in a growth story (no pun intended) that continues to frame Snapchat as the underdog with less active users for their Stories feature than Facebook’s products. Instagram Stories has already surpassed Snapchat’s 160 million daily active users by reaching 200 million users just three months after launch. WhatsApp’s Snapchat Stories clone reached 175 million daily active users just 10 weeks after launch. Facebook knows it can be destroyed. It knows complacency will allow a competitor to disrupt them sooner or later. They’ve ingrained the need to win and innovate so deeply into their culture that they’re completely unashamed to copy the core feature of a competitor and blatantly add it to all of their products. And that’s a good thing, they’re doing exactly what they need to maintain their lead and execute on their long-term vision as a company. You shouldn’t be afraid to copy if you need to. For any company that lasts long enough, they’ll face a period that they have to copy in order to get back in the game. The people who use your product (and your competitor’s products) come first. They are what matter and by focusing on your customers you’ll figure out how to keep them. Facebook saw Snapchat chipping away at one of their key user segments and reacted in a huge way. They threw everything they had at the problem. Took their products and decided to introduce one of Snapchat’s core features across all of them. Risky. Bold. Effective. I’ve personally made the mistake that Facebook has flawlessly avoided. In the past, I’ve ignored the competition and as a result left customers high and dry. Made it easy for them to switch from our products to the competition. We literally handed our customers to competitors, over and over again. We weren’t paranoid. We weren’t risky. We weren’t bold. We were ignorant. When we first started KISSmetrics, we did all the right things. Combing the Internet for reviews of analytics tools and analyzing them to find people’s biggest problems. Surveying potential customers to understand what challenges people had with existing analytics tools. We also did interviews with potential customers. The research led us to discover (and solve) three of the most important problems people had when analyzing user behavior in existing analytics tools. It was difficult and time consuming to create and understand funnel reports. It took anywhere from a few days to a few weeks to implement and debug data when you wanted to track new data. There was no possible way to pass user level data so you could see who did what within your product. Our MVP was designed to solve each of the three critical pain points that we discovered. It was built in one month from blank slate to release. It was horribly slow and had ugly code with bugs. Despite the issues with our fast MVP of KISSmetrics, people really loved it. Our funnel reports could be created in seconds and were really easy to use and understand. Implementation and debugging could be done in just a few minutes. We invented a new analytics data model where every piece of data in KISSmetrics was tied to an identity, either an anonymous cookie or an email address. We were ahead of the market by 5 years. Then we began to slip. A few years into our business, our execution slowed. We were no longer innovating and staying ahead of the curve. We were doing customer research but completely ignored our competitors. As a result, we missed out on critical information about our customers and the things outside of our product that they cared about. It was a matter of time before competitors would get ahead. You really have to be paranoid about execution. Innovation isn’t just one and done. You always have to move on to the next thing and be aware of your competition. If you don’t build a product engine to support innovation, someone else will come up behind you. They will copy what you have and will push past you. If their team is great at copying, their innovation abilities probably won’t be as good. But any improvements they make on even just a single piece of what you’ve created will help them pull ahead. They just have to get a littler faster and improve better than you. Speed really does matter. You can’t just capture the market once and expect to keep it. You have to do it over and over again and faster than everyone else if you want to keep distance from competitors coming up behind you and disrupting you. That’s how you get ahead of the market. Sometimes, you’ll slip up. You’ll miss the next innovation. Someone else will find it first. It happens to all of us. When it does, you shouldn’t be ashamed of copying that feature to close the gap. That’s what we should have done at KISSmetrics. But we didn’t. At KISSmetrics we underestimated the impact of competitors who successfully started to cannibalize the market. They made incremental improvements and targeted different up-and-coming customers that we missed. Our product was web-focused and they quickly focused on mobile apps. Even to do this day, KISSmetrics still doesn’t work well for mobile apps. Mixpanel had a free plan (KISSmetrics didn’t) and a way for people to track even more data for free by installing a badge on their website. We just brushed their strategy off primarily because it would be expensive for us to do. We assumed the customer support and infrastructure costs would be too high for us to provide something similar. We should have copied Mixpanel’s strategy as soon as we saw the site badges in the wild. We were first to create a real-time analytics debugger in the analytics space. It was designed to help people implement and debug their data. It turns out that people don’t get much more value from the feature beyond that. We missed one thing: eye candy. The real-time view looks really cool when it’s left open and you can watch it. Mixpanel realized this feature helped them close deals. They hyped it up during sales demos much more than we did. They also improved it so it had more eye candy than ours. We ignored what they did, didn’t think about the “why” behind it, and lost a ton of sales. A new competitor called Heap came into the space even later than Mixpanel. They had a very strong value proposition by having a simple API to implement analytics tracking. They enabled people to install a single tracking script once and track every single thing people did on a website automatically. When they first started we could have easily copied the feature and destroyed their momentum. We didn’t. They now have over 5,000 customers today and raised a total of $40 million. These were just a few instances when competitor ignorance and poor execution really hurt us. We were actually great at coming up with the right ideas and instead of executing (and iterating) fast on them, we watched others come up with them later and execute much faster. We missed the boat on many great opportunities to make customers love us even more. We ignored competitors instead of learning from their moves to evolve our market hypothesis. We didn’t prioritize our product development with the right data. We were missing critical pieces of information because instead of looking at competitors to understand our customers better, we completely ignored them. We lost out on multiple billion-dollar opportunities by not doing the right things after we initially innovated.